Rihanna is feeling the love in Saint Laurent heart-shaped cape | HELLO! Talk about wearing her heart on her sleeve! Rihanna appeared to hint that she is truly loved-up with Drake by stepping out in a giant red fur cape in the shape of a heart on Sunday night. The singer made no attempt to go under the radar as she left New York's 1Oak nightclub in the statement Saint Laurent design, which she paired with denim shorts, strappy heels and a black baseball cap. Although Drake was nowhere to be seen, the pair have been spending lots of time together in the past few weeks – with the Diamonds singer even reported to have got a new tattoo as a tribute to her boyfriend. The 28-year-old opted for a shark design with camouflage-pattern detailing, prompting some fans to suggest it is a tribute to a gift she received from the Hotline Bling hitmaker. The design closely resembles a stuffed toy shark which Rihanna was spotted carrying after she and Drake enjoyed a night out at Ripley's Aquarium in Toronto, with many believing the toy was a gift from the rapper. It has been an exciting few months for Drake and Rihanna, who have rekindled their romance. 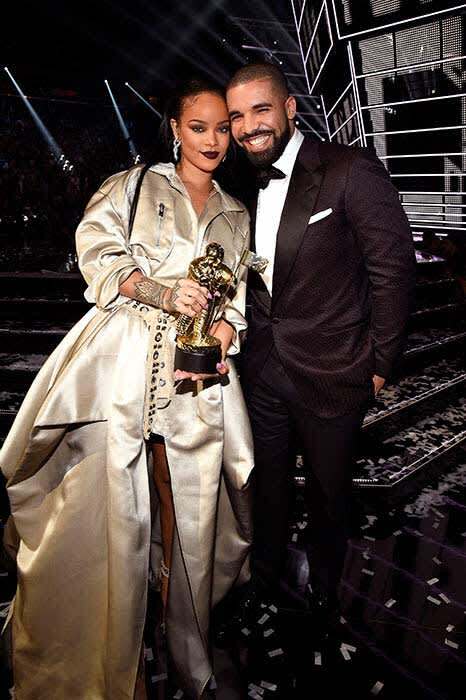 The pair confirmed their romance earlier this week at the VMAs, when Drake presented Rihanna with the coveted Michael Jackson Video Vanguard award. Introducing Rihanna, he said: "She's someone I've been in love with since I was 22-years-old. She's one of my best friends in the world." The couple then appeared to briefly kiss on stage, sparking a social media frenzy amongst fans. News of their romance hasn't come as a complete surprise. Earlier this year, a source revealed to E! News that they were definitely an item, saying: "He still loves her and never stopped. Rihanna is the one that's been not wanting to settle down in the past," the insider tells us. "They are having fun spending time with each other. Their music together got them close again."